Valentine’s Day is just around the corner, so here is a way to encourage speaking and hopefully make everyone feel good about themselves. I have always had mixed feelings about Valentine’s Day because people respond to this day in so many different ways. There are couples who are in love and spend this day together happily. There are couples who get into arguments because one of them has forgotten about Valentine’s Day or the romance is missing from the day. There are single people who don’t care about Valentine’s Day and see it as just a commercial holiday, or they know happiness comes from within and not from another person. There are single people who are anti-Valentine’s Day and boycott the day with pranks or jokes. And there are single people who feel lonely on Valentine’s Day. There are so many different emotions that people feel, is it likely that all your students will feel the same about Valentine’s Day? Why not use Valentine’s Day as an opportunity to give compliments and make everyone feel good about themselves? When I was younger, there were some sweets in the UK called ‘Love Hearts.’ Each sweet had a different message. You can see all the different messages here. Some were romantic, some weren’t. Some were just compliments. My brain shouted out to me as I walked to work. How could I present these compliments to the class? I wanted a way for students to use their mobile phones and I wanted them to practice listening, reading, speaking and writing. A tall order. Then I remembered that there is a segment on Japanese TV called tanakuji. You can see a YouTube clip of it here. The idea is that several pictures of text flash across the television screen and the audience is asked to take a photo. When you take a photo you see an image of text. The text is usually a message, words of wisdom or your fortune for the week. There are several examples on Pinterest and Instagram. I thought it would be fantastic to have a classroom adaptation of this, so I made a PowerPoint version called Lucky Dip. Click on Lucky Dip Demo – Numbers to see how this would work in PowerPoint. I brought the ideas of ‘tanakuji‘ and ‘Love Hearts‘ together and made a Valentine’s Day themed version of Lucky Dip. 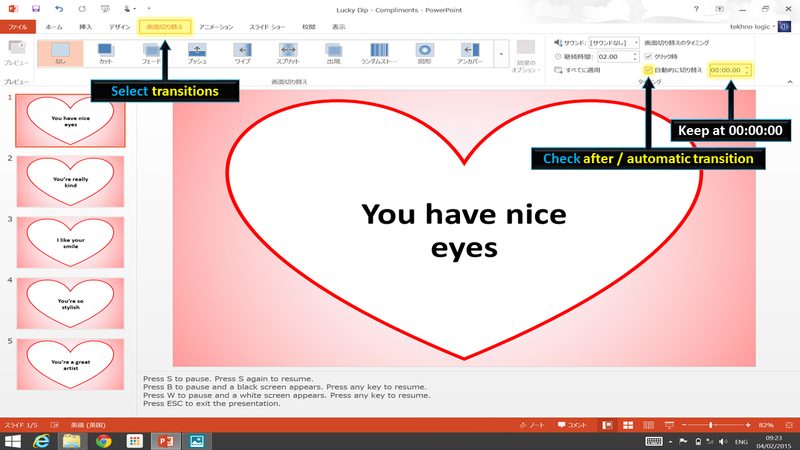 Click on Lucky Dip – Valentine’s Day Version to download the PowerPoint or click here to visit the downloads page. 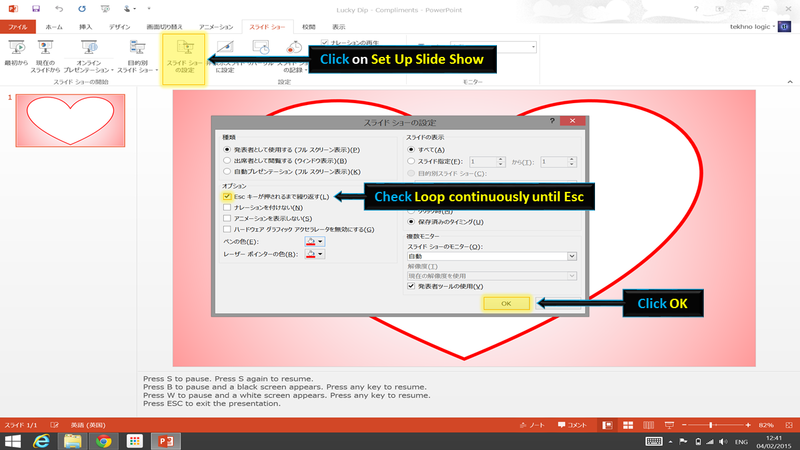 After you have added a new slide, write your text in the box. Then go to the ‘transitions’ ribbon (toolbar) and on the right-hand side check the box for automatic slide transition. Keep the time at 00:00:00. This means that the slide will change as soon as it has been viewed. 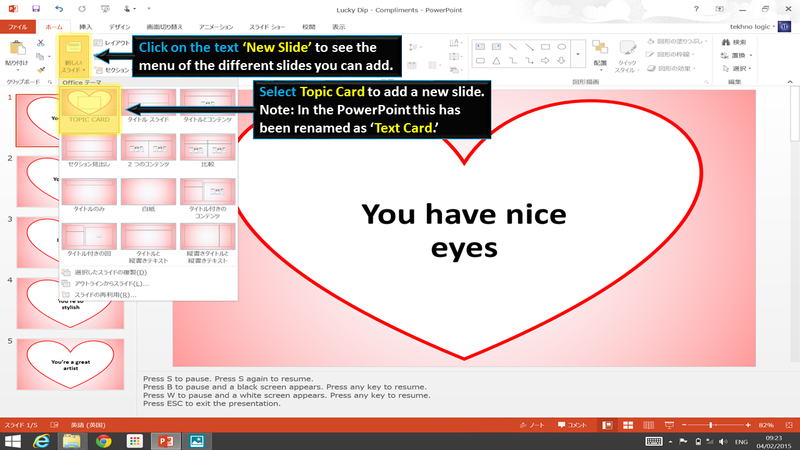 Add as many slides as you need. When you start the slide show (F5) and the text will change rapidly. There are two ways you can use Lucky Dip. The first way is to get the students to use their mobile phones. Tell the students to get their cameras ready. Start the slide show and the students take a photograph when they are ready. The students go back to their groups and read the text from their photograph. The other students in the group write down the compliment. Repeat as often as it needed. You could try setting the students a challenge to collect 5 compliments or as many compliments as they can within a time limit. Press ESC to end the slide show. ADVICE: Pause the PowerPoint so students aren’t look at fast moving images for a long time. Press S to pause the slide show. Press S to resume the slide show. Press B to pause the slide show and a black screen appears. Press any key to resume the slide show. Press W to pause the slide show and a white screen appears. Press any key to resume the slide show. The second way is a matching exercise. Before the class starts, place the compliments around the room. You can hide them a little to make it more challenging. Divide the class into groups of 3 or 4 students. Ask 1 student to stand up from each group. Press S to pause the PowerPoint. Ask the students to look around the room to find the matching phrase and hand it to you. Their team mates can help them by shouting advice or ideas. Change. A new students from the groups stands up. Repeat the activity. 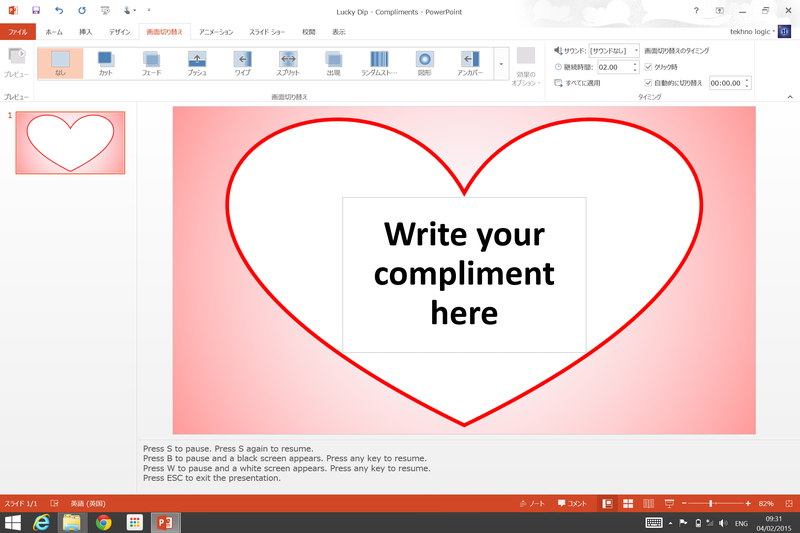 Follow up by asking the students to make their own compliments. You may need to discuss what makes a good compliment. These compliments could then be turned into cards or a classroom poster. Lucky Dip is a new activity for me as well and I can’t wait to try it out. If you try it before me, let me know how it went by leaving a comment. 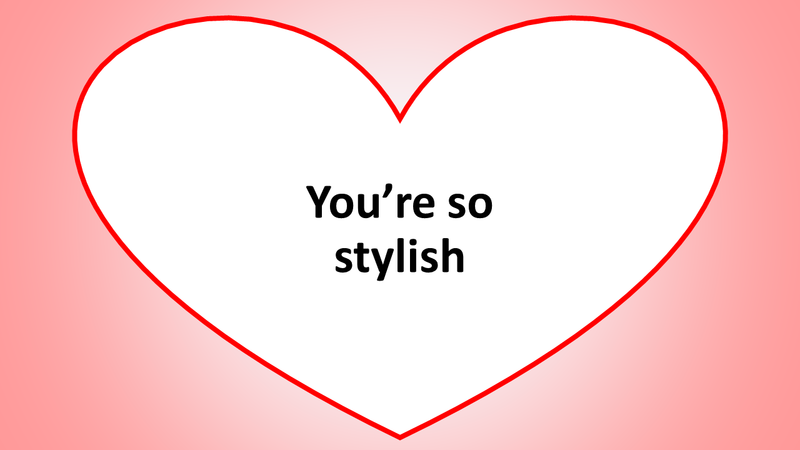 Teachervision has a lesson plan based around making Valentine’s Day cards. Teach-nology has a lesson plan based around making a ‘Friendship Poster’ where students used Microsoft Word to create a poster. Click on Lucky Dip – Conversation Topics to download the PowerPoint or click here to visit the downloads page. This version of Lucky Dip works in exactly the same way as the Valentine’s Day version. 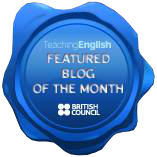 With this version of Lucky Dip, add conversation topics to get your students speaking. If you are involved in preparing students for IELTS, add practice questions to Lucky Dip. Students can then review topics you have covered or practice a wide range of questions. Classroom Management – Add different rewards or points for positive reinforcement. Be culturally sensitive about the color you use with names. For example, writing a name in red is symbolic of death in some countries. Activities – Keep a list of activities that your students really enjoyed and use Lucky Dip to pick a random activity for the day. This can also be a classroom management aid. Number Games – Use Lucky Dip to generate random numbers for games like Bingo or playing a Lottery based game. 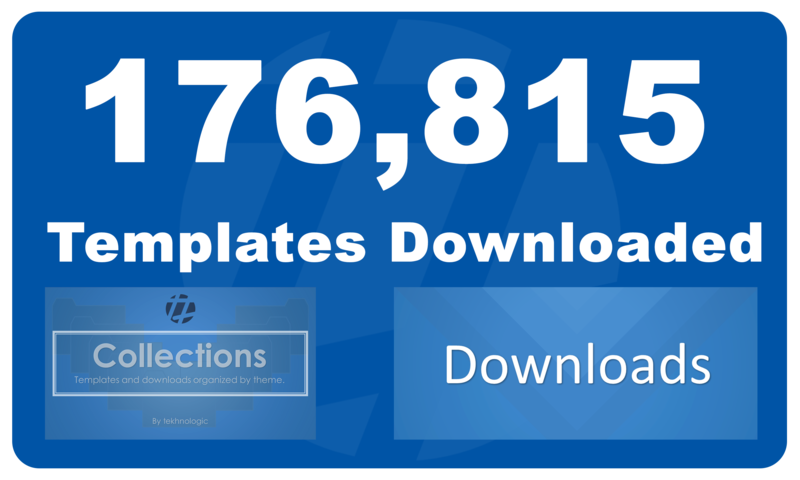 Adding slides with numbers is similar to a random number generator. You can choose to have the numbers in order or re-arrange the slides so that they are out of order. Unlike a random number generator, students can try and time when the number they want will appear. Can you think of any more ideas? If you can, leave a comment and let me know.